► We now have the link for Episode 11 of Inside BU Hockey featuring interviews with Head Coach David Quinn, senior forward Jake Moscatel and former Terrier David Warsofsky, who scored his first NHL goal last week. At the World Junior Championships on Tuesday, Team USA was edged by Canada, 3-2, in a contest that decided first place in Group A. The U.S. squad will meet Russia in the medal-round quarterfinals at 6 a.m. ET on Thursday. The game airs on NHL Network and will be streamed live on NHL.com. 2014 recruit Jack Eichel led Team USA with five shots and also won seven of ten face offs. Matt Grzelcyk — Grzelcyk was so good early in the game and remained pretty solid throughout. He was on the ice for the first Canadian goal which turned the tide and was one of two U.S. defenseman who couldn’t corral a puck. Other than that though, Grzelcyk was a factor due to his speed and poise with the puck. Jack Eichel — Team USA’s most dangerous forward for a lot of the game, Eichel nearly scored himself when he sent a seemingly weak shot on net, but Fucale squeezed the pads just before it went through. He had five shots in the game and generated a lot of chances. The one thing I didn’t like was Eichel trying to do a little too much in the second period when the game was starting to turn Canada’s way. He’s a young guy and I think he tried to put the team on his back a bit, but his shot selection wasn’t great in the middle of the game. He had a lot into legs and that led to turnovers. Other than that though, his speed, his strength on the puck and his patience for much of the game was remarkable. Eichel is some kind of player. At the World U17 Challenge, the USNTDP U17s defeated Canada Atlantic, 9-1. 2015 recruit Jordan Greenway registered an assist and has a 3-1-4 scoring line in three games. Fellow 2015 recruit Charles McAvoy has 1-2-3. Next opponent is Canada Ontario on Thursday at 6 p.m. ET with the game live streamed on FastHockey. ● Hockey Canada box score and archived video replay. OverTheBoards.net announced that Eichel was its top performer among college prospects for calendar year 2013. After spend most of the 2012-13 season with the NTDP U17s, Eichel scored 18 points in 22 games for the U18s. This season he has 19 goals and 20 assists in 22 games for the U18s. Terrier freshman Nick Roberto, who led Kimball Union Academy in scoring with 48 points last winter earned honorable mention. 2014 recruit and Youngstown Phantoms top goal-scorer J.J. Piccinich skated with the NTDP U18s in their 4-2 defeat of the Miami University, taking Eichel’s spot centering the team’s top line. He finished +1 for the evening. 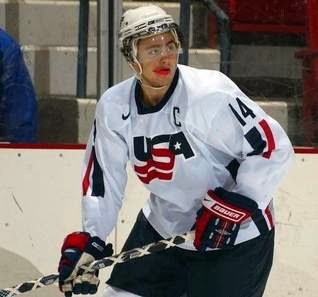 Former BU captain and All-American Kevin Shattenkirk was named to the U.S. Olympic hockey team, one of the 20 ex-collegians on the 25 man roster. The standout Blues’ defenseman represented USA Hockey for two seasons with the NTDP program, captaining the U18s (photo) to the silver medal in the 2007 World U18 Championships. This season he has a 6-22-28 scoring line in 38 games. Nick Bonino scored a power play goal and added an assist as the Ducks doubled up San Jose, 6-3. Bonino now has an11-16-27 scoring line. Matt Nieto registered an assisted for the Sharks. Alex Chiasson assisted on two goals for Dallas as the Stars edged the Kings, 3-2.